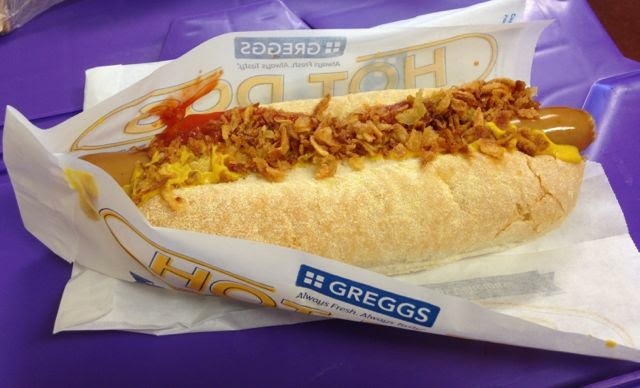 I was quite excited to find that Greggs have started selling hot dogs as one of their new foods. The lovely folks from Greggs asked if I wanted to give one a try, and I couldn’t resist. There happens to be a very large branch of Greggs near me and it has just reopened following refurbishment so I thought this would be a nice excuse to give it a try out. I ordered the hot dog and had it fully loaded with plenty of ketchup, mustard and onions. A colleague also chose to give one a try, but had initially not been that enthusiastic at the idea (she is a Cheese and Onion Pasty kind of girl). She went along with the hot dog idea though, she too had all the toppings. The hot dogs came in a cute paper wrapper, and the onions on top looked liked dried onions, they were crunchy too. I liked the mix of textures, the bread was very soft and fluffy, but then Greggs are bakers, and the meat was firm and the onions were lovely and crisp. The hot dog sausage tasted authentic, with that proper frankfurter taste whihc was seriously good. The ketchup was sweet and mustard had that lovely kick of American flavour. In short I thoroughly enjoyed my hot dog as did my previously unconvinced friend. She said the toppings and the crunchy onions made it for her. I was impressed by just how filling the hot dog was too, it did me nicely for lunch.